Western Province Councillor, Minister Gamini Thilakasiri was appointed the Chief Organizer for the Sri Lanka Freedom Party (SLFP) in the Homagama district. 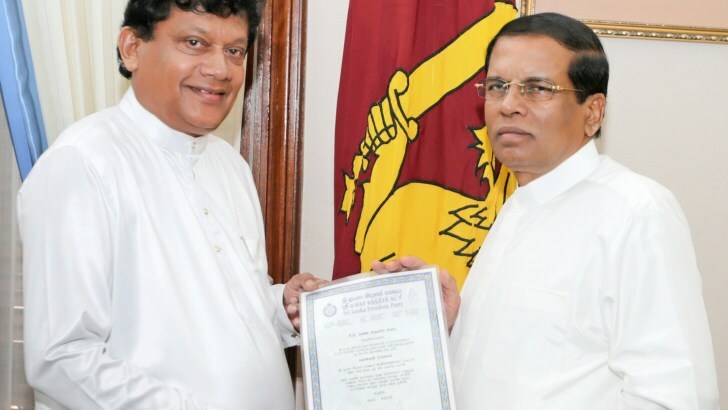 President Sirisena handed over the letter appointing him at the President’s Office this morning. The position was vacated yesterday, when United People’s Freedom Alliance (UPFA) MP Bandula Gunawardena announced his resignation. Gunawardena cited as reason for his resignation President Sirisena's decision to remove members of the rebel 'Joint Opposition' from organiser posts within the party, last week. Thirteen Joint Opposition members were stripped of their positions, and 40 new appointments to district and electoral positions were announced.